Looking for timing belt replacement near Cotati? Look no further than RPM Automotive Services. We are happy to replace timing belt. 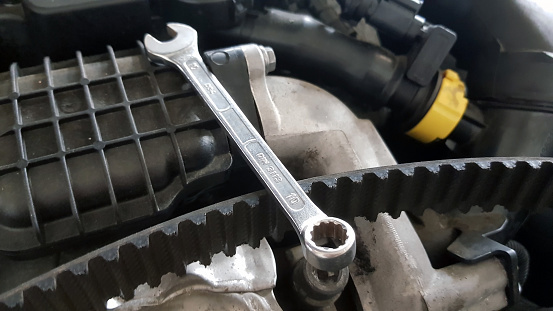 The timing belt is a belt made of rubber that keeps your camshaft and your crankshaft synchronized so that your valve timing is always correct. Some vehicles have a timing chain instead of a belt, but it serves the same purpose. If your timing belt is not doing its job, your engine won’t run properly, and may even stop working completely. The belt also regulates the power steering and the water pump. Therefore, we inspect the water pump at the same time. If your water pump needs replacement we recommend doing this at the same time in order to save money by not paying for extra labor costs in the future. As a general rule of thumb, you can expect to replace your belt every 60,000-90,000 miles. We recommend replacement every 80,000 miles to ensure that the engine continues to run efficiently, and that there are no surprise break downs. A bad timing belt can cause the camshaft and crankshaft to be out of synchronization, and this can be catastrophic for the car’s engine. It throws the valve timing off, and you can end up with bent valves, bent piston rods, or destroyed pistons. With regular maintenance you’ll know ahead of time when its time to replace timing belt, so you can plan your time and budget accordingly. Give us a call today to schedule your appointment for a timing belt replacement near Cotati or at (707-800-4586). Or, schedule your appointment online here. We look forward to inspecting your vehicle and being your go-to location for all of your automotive repair and maintenance needs.